In ancient Egyptian history, the Old Kingdom is the period spanning c. 2686–2181 BC. 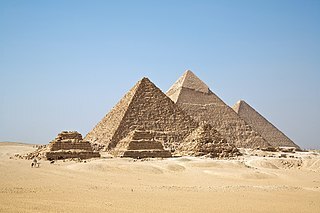 It is also known as the "Age of the Pyramids" or the "Age of the Pyramid Builders", as it encompasses the reigns of the great pyramid builders of the Fourth Dynasty—King Sneferu perfected the art of pyramid-building and the pyramids of Giza were constructed under the kings Khufu, Khafre and Menkaure. Egypt attained its first sustained peak of civilization—the first of three so-called "Kingdom" periods which mark the high points of civilization in the lower Nile Valley. Hetepheres II was a Queen of Ancient Egypt during the 4th dynasty. The Pyramid of Menkaure is the smallest of the three main Pyramids of Giza, located on the Giza Plateau in the southwestern outskirts of Cairo, Egypt. It is thought to have been built to serve as the tomb of the fourth dynasty Egyptian Pharaoh Menkaure. Prince Ankhhaf was an Egyptian prince and served as vizier and overseer of works to the Pharaoh Khufu, who was Ankhhaf's half-brother. He lived during Egypt's 4th Dynasty. Khafre Enthroned is a funerary statue of the Pharaoh Khafre, who reigned during the Fourth dynasty of ancient Egypt. It is now located in the Egyptian Museum in Cairo. The construction is made of anorthosite gneiss, a valuable, extremely hard, and dark stone brought 400 miles down the Nile River from royal quarries. This highlights Khafre's importance and power as a ruler. The statue was carved for the Pharaoh's valley temple near the Great Sphinx, a part of the necropolis used in funeral rituals. This Old Kingdom statue has an important function in Egyptian tombs as substitute abodes for the Pharaoh's ka—the life force that accompanied a person with a kind of other self. After death, the ka leaves the body into the afterlife, but still needs a place to rest: the statue.